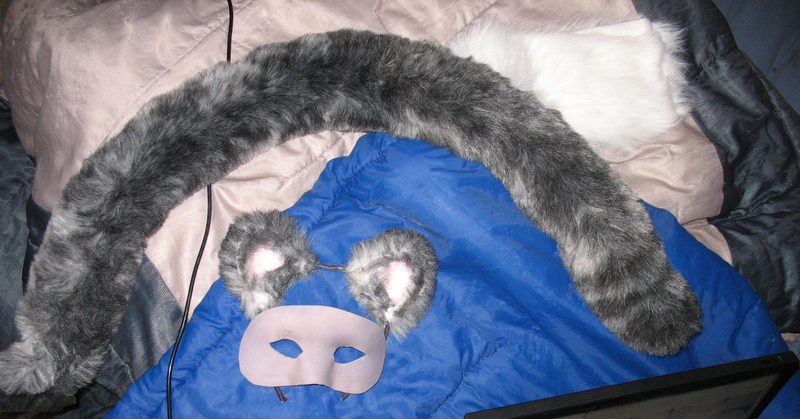 I had a bunch of pale-gray leather left over from Gaara's armor, and it's been sitting in a bin doing nothing. So, I cut out a very, very basic piece of leather on someone's idea. I cut some poor eyeholes into it, tied it not so good to my head after soaking it in water for a few hours, and slept with it on. This was, supposedly, going to mold it to my face. ...This idea didn't work so well. Fell off in the middle of the night, got squished, ruined. I cut the piece of leather into a more accurate shape, cut the eye holes better. I soaked it for about two hours in warm water, then carefully clipped it to this plastic mask (I went with the slightly more expensive but sturdier mask of the two I found at the store).... now, I have a very strange device at my house which is basically one of those fancy "sit under and pull over your head" hair dryers from a beauty salon. I propped up a laundry basket, some pillows, and whatever until this mask was sitting inside the dryer and turned it on for 30 minutes. I bet you could do it with a very low temperature oven maybe or a very long time with a hand dryer. It fit the curves of my face nicely like this. I was incredibly pleased. Now, my original design was that the mask was actually going to be over black/white/gray/blue makeup to make for a very striking face. 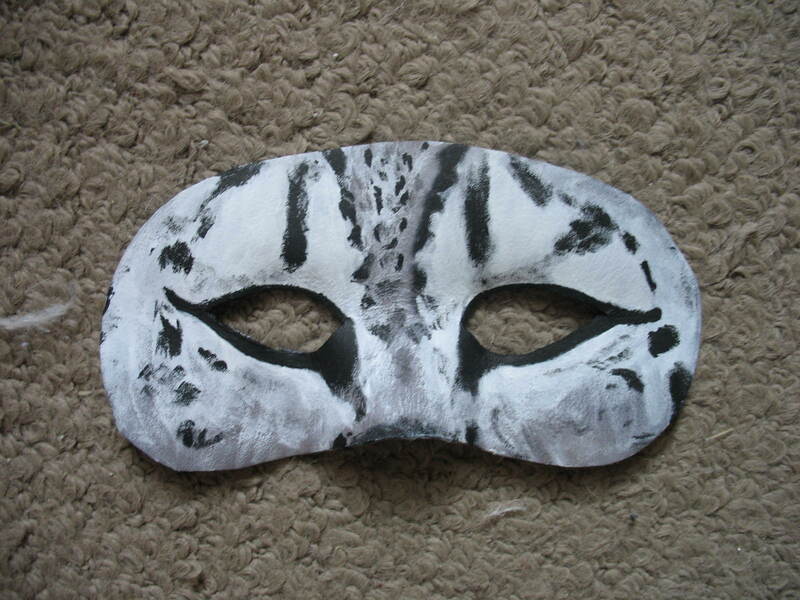 So I went at the mask with three dry paint brushes, building up layers. White went on first, followed by black, followed by more white.